I saw my first butterfly of the season today on April 9th. It was orangish, medium size, maybe with some darker spots or patterns of some kind on the wing, moving fast – okay it’s already gone! What was it? How in the world can I figure out what species of butterfly that might have been with only that small bit of information? It turns out that a sighting like this is common for many fast flying butterflies, but there actually is an abundance of information in that brief encounter that might help identify the butterfy. Let’s see how we might determine what species of butterfly just fluttered by…. First a disclaimer. The above photo is not the same butterfly I saw on April 9th. You’ll notice in the above photo that the grass is mature and dry, indicating a mid to late summer photo taken in the WSU Arboretum, which it is. But the photo gives you some idea of the general wing shape that fluttered by me, although that unknown butterfly was smaller, the orange coloring was more muted, and it did not have the conspicuous large spots as on the above butterfly, which I believe may be a Hydaspe Fritillary (Speyeria hydaspe). However, I am certainly willing to be corrected by an expert! How might we begin to identify a butterfly from such a fleeting glimpse? There are many good online sources of information on butterflies and moths. Let’s look at several of them and see if they can help us. The web site, Butterflies and Moths of North America, might sound a bit imposing if you only want to identify a butterfly in your local area, but if you go to their regional checklist page, and sequentially insert the search terms “butterfly”, then “United States”, then “Washington”, then “Whitman County”, and then hit the Apply button, you are presented with a list of the confirmed sightings of butterfly species for Whitman County that have been submitted to this organization. So already, you’ve narrowed the list of potential butterflies down considerably. However, even here, there are about 90 listed butterfly species, which still might seem overwhelming. At this point, it’s helpful to book mark the page, but look at additional sources that might help you narrow your search down. If you do a quick web search on Washington butterflies, you’ll see a page pop up in the list for Eastern Washington Butterflies. Scroll down through the photo samples of representative butterflies you see here, and you’ll probably notice that some of the more orange colored butterflies are tortoise shells, angle wings, fritillaries, checkerspots, and cresent butterflies. 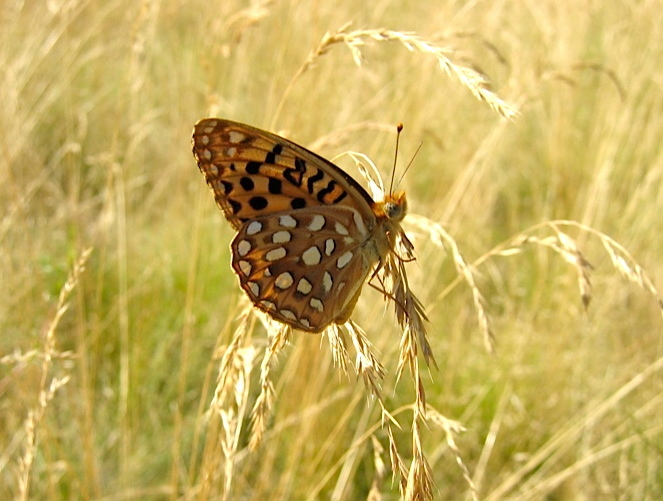 Given the wing shape and coloring that zipped by me, I’m now suspicious of it being in the fritillaries. If that ballpark guess about the right general group of butterflies is correct, then we’ve narrowed it down to about six species. At that point, you can look at photographs for each of the six species and take your best shot at identification. Another fun identification guide that also helps narrow down searches can be found at the Discover Life web site on their identification guide for butterflies. At this site, we can select “orange” for the various distinctive colors of segments of the wing, as well as “Washington” for the region, and then hit the search button. The result is a narrowed down list of 18 possible species, each with a link to a photo. 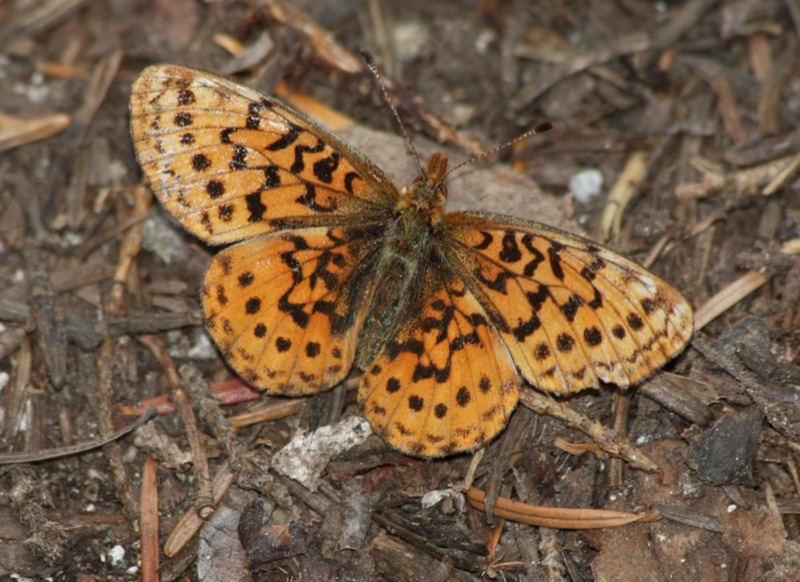 The fourth photo I look at seems like a possibility, so then I do some more searching for information on Pacific Fritillary (Boloria epithore) and remember I’ve got a butterfly field guide gathering dust on my office shelf. I look up the picture for Boloria epithore, here called by the common name, Western Meadow Fritillary, and I immediately notice a few things about the description: “This is the smallest fritillary in the region and usually the first fritillary to fly in the spring.” In addition, I notice that the larval food source is violets (Viola spp. ), which is one of the early flowering plants in spring in Palouse Prairie. The size, coloration, and behavioral description matches, and I may well have identified my mystery butterfly! So am I confident I that identified my mystery butterfly? Not really. 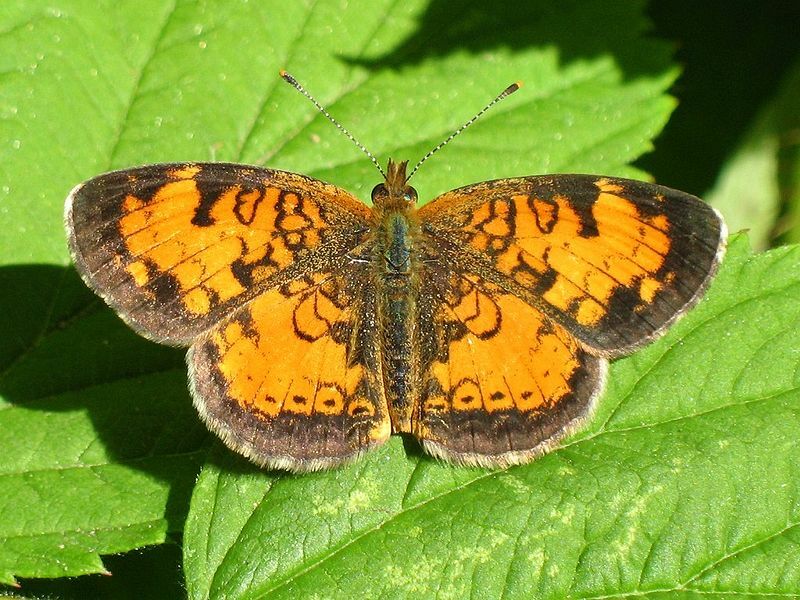 Another butterfly field guide that covers all the species in the Pacific Northwest, The Butterflies of Cascadia, by the expert Robert M. Pyle, has a picture of a northern crescent, another widespread, orange colored butterfly that can be found flying in April. In looking at the photo, I decide that I can’t rule out that my mystery butterfly might not have been an early flying crescent. In the end, my various online and field guides helped me narrow down the possibilities, and though I didn’t reach a definitive conclusion about the identity of my first butterfly sighting of the season, I had fun for a few minutes trying to figure it out and learning more about the mysteries of life that occur daily all around us. And it leads me to wonder how and where these species manage to survive on our now highly modified landscapes. My mystery butterfly will remain a mystery. But that’s alright. It’s nice to have a few mysteries to investigate once and a while. And most of all, it was nice to see this tiny bit of energy and color fly by as an obvious sign that spring has arrived.